The traditional Treatment For Plantar Fasciitis include stretching the calf, massaging, decreasing one's training, losing weight, purchasing better-fitting shoes (with a raised heel and arch support), icing the sore heel, and taking ibuprofen. For better understanding of Treatment For Plantar Fasciitis, we first need to understand what is Plantar Fasciitis ? Plantar fasciitis is an inflammation (irritation and swelling with presence of extra immune cells) of the thick tissue (plantar fascia) on the bottom of the foot that causes heel pain and disability. There is excessive wear to the plantar fascia or plantar aponeurosis that supports the arches of the foot or by biomechanical faults that cause abnormal pronation. The pain is usually of gradual onset and felt classically on the underside of the heel. Initially, it is worse in the morning and decreases with activity. Jobs that require a lot of walking on hard surfaces, shoes with little or no arch support, a sudden increase in weight and over activity are also associated with the condition. The plantar fascia (plantar aponeurosis) is the thickest fascia in the body. It is a dense,fibrous connective tissue structure originating from the medial tuberosity of the calcaneus. Of it's three portions-medial, lateral, and central bands-the largest is the central portion. The central portion of the fascia originates from the medial process of the calcaneal tuberosity and extends through the medial longitudinal arch into the individual bundles and inserts into each proximal phalanx. The medial calcaneal nerve supplies sensation to the medial heel. The nerve to the abductor digiti minimi may rarely be compressed by the intrinsics muscles of the foot. Some studies suggest that nerve entrapment (abductor digiti quinti) does on rare occasions play a role in inferior heel pain. The plantar fascia is an important static support for the longitudinal arch of the foot. 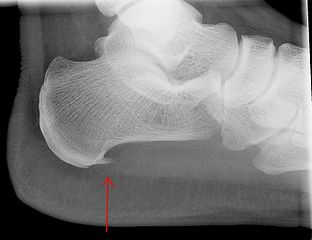 Strain on the longitudinal arch exerts its maximal pull on the plantar fascia, especially its origin on the medial process of the calcaneal tuberosity. The plantar fascia elongates with increased loads to act as a shock absorber, but its ability to elongate is limited (especially with decreased elasticity common with age). Passive extension of the metatarsophalangeal (MTP) joints pulls the plantar fascia distally and also increases the height of the arch of the foot. As the toes dorsiflex, the fascia is wound around the metatarsal head (windlass effect). In doing so the fascia is tightened and longitudinal arch elevates. 1) Inflammation of plantar fascia is common in sports which involves jumping and hill running. 2) Overuse may cause micro tears and inflammation. 3) Normally, during midstance, the foot is flattened, stretching the plantar fascia and enabling it to store elastic energy to be released at toe off. 4) Mal alignment faults may increase stress on the fascia, excessive rearfoot pronation will lower the arch and overstretch the fascia. 5) Weak peroneii, often the result of incomplete rehabilitation of ankle sprain will reduce the support on the arch thus stressing the plantar fascia. 6) Congenital problems such as pes cavus and pes planus will also leave an athlete more susceptible to plantar fasciitis. 7) Plantar fascitiis is exacerbated if the achilles tendon is tight or if high heels are worn. 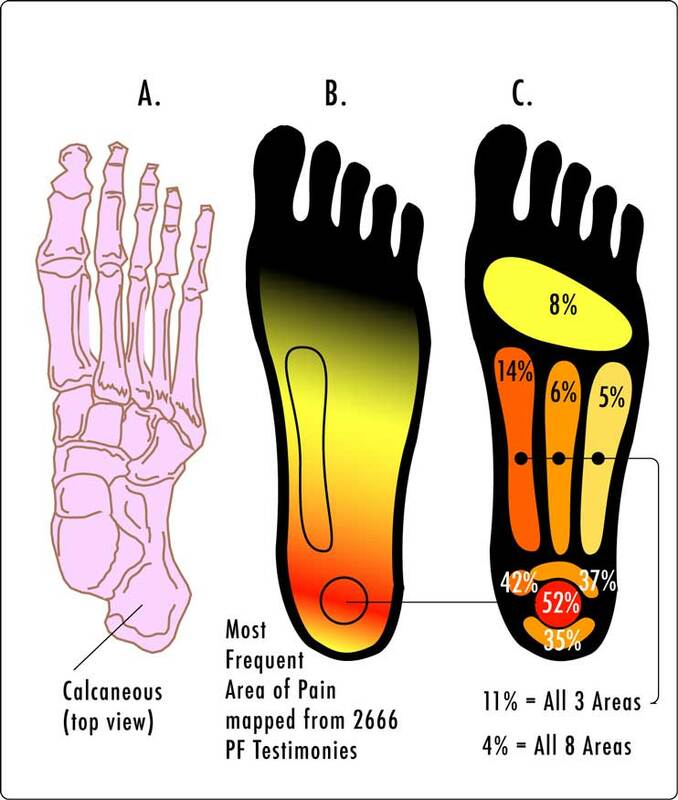 8) Inadequate rearfoot control may fail to eliminate hyper pronation and a poorly fitting heel counter will allow the calcaneal fat pad to spread at heel strike transmitting extra impact force to the calcaneus and plantar fascia. 9) On a hard surface the shock absorbing qualities of the shoe are important and the patient's foot wear should be examined. 10) Obesity is also related to plantar fasciitis. Bone spur may be associated with plantar fasciitis, but are not believed to be the cause of it. Many studies show no clear association between spurs and plantar fasciitis. Studies of patients with plantar fasciitis report that 10-70% have an associated ipsilateral calcaneal spur; however, most also have a spur on the contralateral asymptomatic foot. Anatomic studies have shown that the spur is located at the short flexor origin rather than at the plantar fascia origin, casting further doubt on its role in contributing to heel pain. Knowing the exact cause,helps in Treatment For Plantar Fasciitis. Although plantar fasciitis can seem quite debilitating during the acute phase, it rarely causes lifelong problems. It is estimated that 90-95% of patients who have true plantar fasciitis recover with conservative Treatment For Plantar Fasciitis. However, it may take 6 months to 1 year, and patients often require much encouragement to continue stretching, wearing appropriate and supportive shoes, and avoiding high impact activities or prolonged standing on hard surfaces. Operative treatment can be very helpful in selected "failed" patients. Bilateral plantar fasciitis symptoms require ruling out systemic disorders such as Reiter's syndrome, ankylosing spondylitis, gouty arthropathy, and systemic lupus erythematosus. A high index of suspicion for a systemic disorder should accompany bilateral heel pain in a young male aged 15-35 years. The classical presentation of plantar fasciitis include a gradual, insidious onset of inferomedial heel pain at the insertion of the plantar fascia. Pain and stiffness are worse with rising in the morning or after prolonged ambulation and may be exacerbated by climbing stairs or doing toe raises. It is rare for patients with plantar fasciitis not to have pain or stiffness with the first few steps in the morning or after prolonged rest. Tenderness is present on the bottom of the heel, closer to the midline, and mild swelling and redness. There may be presence of nodule with in the fascia. Active toe raise or passive dorsiflexion reproduce the symptoms. 1 ) Examine lower extremity for possible contributing factors- pes cavus(high arch), pes planus(flat arch), leg length discrepancy, fat pad atrophy, signs of systemic inflammatory arthritis, etc. 2) Review and question for possible training errors or overuse findings in runners and athletes. 3) Identify poor shoe wear, hard walking or running surface, supinator or pronator like wear of running shoes. 4) Repetitive daily plantar and achilles tendon stretching has been shown to provide the most effective relief of plantar fasciitis. Stretching should be done each morning before ambulation and 4-5 times throughout the day. 1)Relative rest- Discontinue running and walking for exercise until asymptomatic for 6 weeks. Switch to low impact exercise like stationary bicycling, swimming, deep water running with an alpha belt. Weight loss and modification of hard surfaces (cement) to soft surfaces (grass or cinder). 2)Anti-inflammatories- Oral anti-inflammatories have variable results. A brief trial of a cyclooxygenase (COX-2) inhibitor is tried. If response is not dramatic, this therapy is discontinued because of the possible side effects. 3)Ice Massage- Ice on the area of inflammation for anti inflammatory effects. Use ice in a paper or Styroform cup (peeled away) for 5-7 minutes, make sure to avoid frost bite. 4)Low-dye Taping- Some patients obtain relief with low-dye taping, but from a practicality standpoint, daily taping is difficult to maintain. 5)Shoe wear Modification (Running shoes)- Flared, stable heel to help control heel stability. Firm heel counter to control the hindfoot. Soft cushioning of the heel,raising the heel 12-15 mm higher than the sole. Well molded achilles pad. Avoid rigid leather dress shoes that increase torque on the Achilles tendon. 6)Cushioned Heel Inserts in Treatment For Plantar Fasciitis- Viscoheels. Soft cushions placed in and out of whatever shoe the patient is wearing. Patient with abnormal biomechanics of the lower extremity, such as pes cavus or pes planus, may benefit from the eventual use of custom cushioned orthotics. 7)Plantar Fascia Stretching- Done 4-5 times a day, 5-10 repetitions. Done before first steps in the morning, before standing after long period of rest. This gives good result as Treatment For Plantar Fasciitis. -Seated plantar fascia stretching- The patient sits with the affected leg bent at hip and knee and heel flat on the floor. The tops of the toes are gently bent upwards with the hand. With the ankle dorsiflexed, pull the toes toward the ankle. Hold the stretch in a sustained fashion for 30 seconds, repeat 5 times a day.The stretch should be felt at the plantar fascia. -An alternate method is to kneel with the toes curled up under the feet (MTP joint extension) and heels off the floor. The buttocks are gently lowered to the heels until a mild tension is felt in the bottom of the feet. Hold for 30 seconds and repeat 5 times per session. Do not bounce. -Another alternate of plantar fascia stretch is, while seated on a chair the patient places MTP joints into hyperextension on the floor and gently presses on the calf to further stretch the MTP joints. Hold for 30 secs.Repeat 5 times per session. -Plantar fascia stretches against the wall- Place the foot against the wall with the heel on the floor and toes on the wall. Now gently lean forward slowly and hold for 30 seconds and repeat 5 times. 8)Runner's stretches for the Achilles tendon- A tight Achilles tendon is often implicated as an exacerbating or a causative factor in plantar fasciitis. For this reason, much attention is given to Achilles tendon stretching exercises. -Soleus runner's stretch- Patient stands facing the wall near a shoulder width apart and places both hands on the wall leaning forwards. The affected leg is kept back and the normal leg in front. Now bend the knees of both the leg, such that the heel remains in contact with the floor. Hold the stretch for 30 seconds and repeat 5 times. -Gastrocnemius runner's stretch- Repeat the same procedure, as for Soleus runner's stretch, but keep the knee of back leg straight and a little more behind. -Achilles stretching on inclined board- Stand with both feet on an inclined plane such that ankle is dorsiflexed and hold the stretch for 30 seconds, slowly leaning forward to stretch the Achilles tendon. 9)Strengthening of the intrinsic foot musculature- Although the plantar fascia is inert, stress on the structure may be increased when intrinsic musculature is weak. Gripping the towel, or objects on the floor, may have a re-education effect on plantar proprioception. If the acute stage measures fail to relieve symptoms after several months, then before initiating chronic stage measures, reevaluate the patient for other causes of heel pain. Consider a bone scan if calcaneal stress fracture is suspected. HLA-B27 and rheumatoid/seronegative spondyloarthropathy laboratory work-up if other systemic signs or symptoms are evident. 1)Casting- In addition to acute stage measures casting has been shown to be helpful in about 50% of the patients. A short-leg walking cast can be used for 1 month with the foot placed in neutral. Evaluate success at 1 month, consider an additional month of removable cast wear if necessary. 2)Orthotics- Patients with very high or very low arches may benefit from orthotic inserts. A less rigid, accomodative insert is applicable to a more rigid cavus type of foot, which requires more cushion and less hind foot control. A padded but rigid insert is indicated for a more unstable foot with compensatory pronation, which require more control. 3)Cortisone injection- Injection of cortisone into the area close to the planar fascia often improves pain, but may weaken the plantar fascia and lead to rupture. One or possibly two steroid injections should be given in a 3-6 months period and only after failure of acute treatment measures. 4)Night Splints- A 5 degree dorsiflexion night splint has been reported to be beneficial. The splint holds the plantar fascia in a continuously tensed state. The theory behind the use of night splint is to minimize the change of tension on the fascia that occurs with each day's new activities. Persistent symptoms for 12- 18 months require operative interventions.